Have you ever heard the term „Idea Machine“? Well, by being an Idea Machine, you’ll become instantly rich, beautiful, you’ll get married, be like on Ecstasy all the time and change the word for the better! According to James and Claudia Altucher all you have to do is the following:write down ten ideas a day. 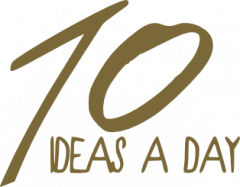 Just ten ideas. The only thing they’ll have to have in common is a theme. (Some people are awesome enough to share their ideas with you. StrangerArray is one of them. And he’s doing a great job! I also had trouble finding themes from beyond my „usual thoughts“ horizon. I have plenty of ideas around my usual hobbies like gaming, business, farming and everyday things. But I thought if there’s one thing that really gets my mind sweating (and that’s what this is all about), it is having ideas on unfamiliar themes. And I guess it could be the same for you. So we developed a website that gives you a random theme. Or ten, if you’re a picky one. Now let’s have some fun and don’t forget that this is „where great ideas are born“.